You knew this was coming. Finally, a worthy competitor to our favorite little KTM 390 Duke. What we’ve done here is take the 399cc parallel-Twin from the Ninja 400 sportbike – which produced 43.7 horsepower and 24.6 lb-ft of torque in that bike on our Dynojet 250 – and house it in a new steel trellis-frame naked bike with nice, upright ergonomics and Kawi’s signature Sugomi styling. Nothing fancy, thanks, but with all the requisite componentry to have plenty of sportbikey fun on the street, even when you’re just zipping to work, with way less of the drama and expense that goes with big-bike ownership. Kawasaki says the whole plot weighs a mere 368 pounds, and will sell for $4,799 with ABS. 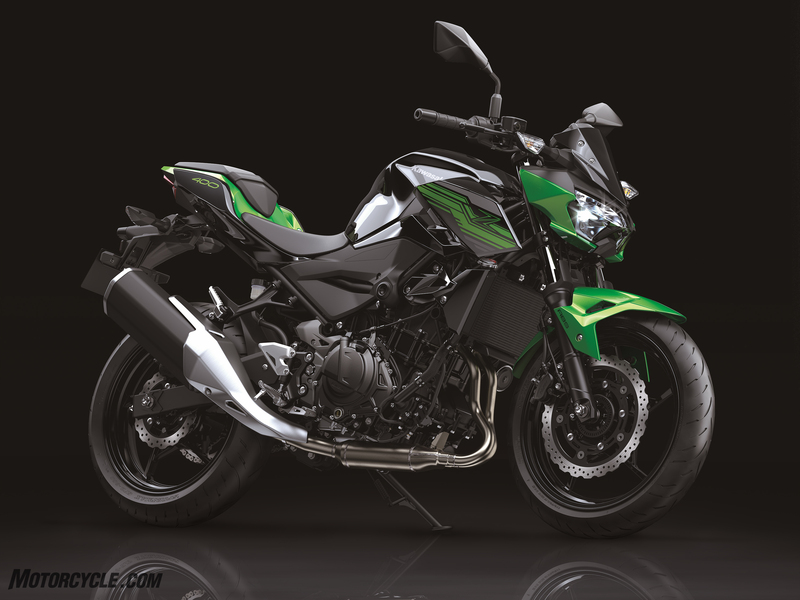 A new entry-lightweight supernaked machine that brings a competitive spirit and small displacement to Kawasaki’s legendary Z series: the all-new Kawasaki Z400 ABS. 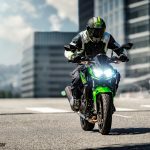 Powered by the class leading engine of the Ninja 400 sportbike, the new naked counterpart is lightweight and nimble for every day street riding, and purpose built for merging stylish looks with core performance. The Z400 was designed to retain the performance of the widely popular Ninja 400 and suit a wide range of riders. With its finely tuned engine and naked chassis package, it offers lightweight handling and stronger low-end feeling – a rider friendly combination that is ideal for fun. Matching its exhilarating performance, the Z400 is clad in aggressive new styling that is inspired by the Sugomi styling of the flagship Z models, and a riding position that enhances the rider’s confidence and control. The newest addition to the Z family, the Z400 motorcycle is packed with premium class leading components and advanced technology, such as the 310 mm front disc and 41mm inverted fork. Supplying the power to “Let the good times roll” is its 399cc parallel twin four-stroke engine, which is paired with a lightweight trellis frame. 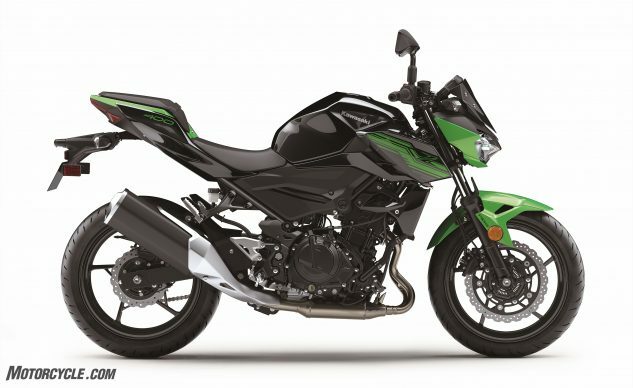 The Z400 features a compact, lightweight, and efficient 399cc liquid-cooled four-stroke parallel twin engine that also powers its Ninja 400 counterpart. The displacement comes by way of the 70.00 mm x 51.8 mm bore & stroke. The high performance of the engine was achieved through careful airbox and intake design, as well as engine internals. Downdraft intake routing plays a pivotal role in producing performance, especially at high rpms, and a large air box offers intake efficiency. The downdraft intake utilizes the shortest and most direct path for air to enter the cylinder, which helps cylinder-filling efficiency and contributes to engine power. Airbox volume was made as tall as possible to ensure sufficient clearance for the intake funnels at 5.8 liters. The airbox features optimized rigidity at the top of the airbox, which reduces unwanted noise, enabling riders to more clearly hear the engine’s intake note when accelerating. Different height on the left and right intake funnels contribute to the engine’s smooth response by allowing torque valleys to be tuned out. To enable smooth and seamless shifting, a close gear ratio was chosen for the transmission, with gears progressing easily from one to the next. Complementing the transmission is a compact assist & slipper clutch, with operating plates that feature optimized rigidity to create a lighter feel at the lever; the clutch has a wide engagement range, facilitating control. When excessive engine braking occurs as a result of quick or accidental downshifts, the slipper cam comes into play, forcing the clutch hub and operating plate apart, which relieves pressure on the clutch plates to reduce back-torque and help prevent the rear tire from hopping and skidding. 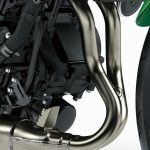 Innovative Kawasaki technology such as the radiator fan cover, which is located behind the radiator, directs hot air out to the sides away from the rider, reducing rider discomfort. Redirecting the hot air also helps keep the tank, frame and other parts that contact the rider cooler. The heat management system was designed using computational fluid dynamics analysis and requires no additional parts to direct airflow inside the engine compartment. Kawasaki’s advanced dynamic rigidity analysis research was utilized in designing the trellis frame of the Z400 motorcycle to ensure optimum rigidity and produce nimble, lightweight handling characteristics. A rigid mounted engine with short mounting brackets was used as a stressed member in the frame to increase rigidity. The chassis has a supersport-style design with a short-wheelbase and long swingarm, which is complemented by a steep caster angle that delivers sporty natural handling. A short wheelbase on the new Z400 contributes to easy maneuverability and the overall wheelbase measurement for the Z400 is 53.9 inches. 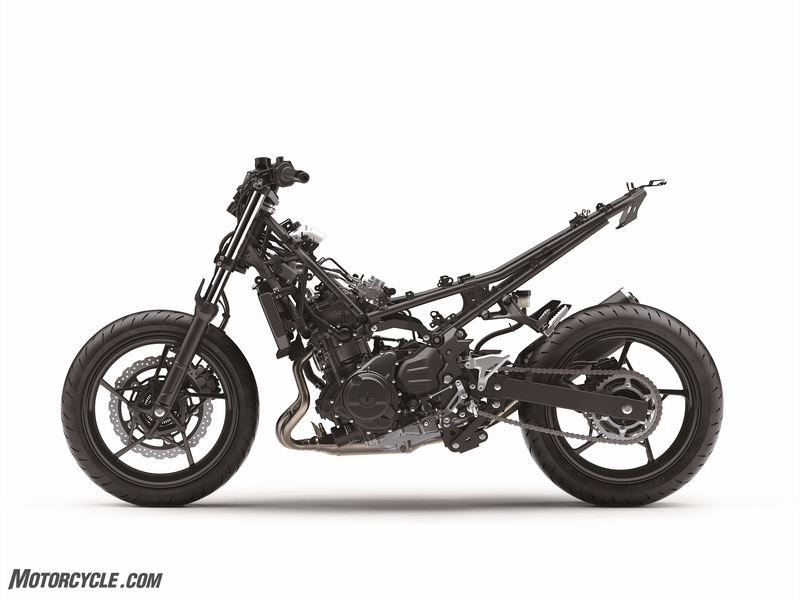 The frame & engine design contribute significantly to the bike’s low curb mass. While it was important to keep the weight down and wheelbase short on the chassis design, it was also crucial to maintain handling characteristics, by adding length to the swingarm. The swingarm and mounting plate design helped contribute to the bike’s overall light weight. The die-cast aluminum swingarm mounting plate eliminates the need to add heavy additional cross member pieces to the frame because it bolts to the back of the engine, allowing the pivot shaft to go through the plate and mount the swingarm directly to the engine. Forming the swingarm from square tubing eliminates the need for additional gusseting, while maintaining rigidity and keeping weight to a minimum. In addition to the engine and frame, other key lightweight contributions came from a slim seat design, wheel design, and heat management system that requires minimal parts. All of these designs helped to create a bike with a curb weight of 368.1 pounds. Complementing the ride comfort of the trellis frame is a large 41 mm telescopic front fork, which provides riders with superb front end feel and traction, facilitating direction changes even when the bike is fairly upright – handy in navigating traffic jams. Thanks to design of the fork, the need for a front fender brace has been eliminated, helping save additional weight. A steep caster angle provides nimble handling feeling, while the optimized linkage ratios and rear suspension settings contribute to the high-quality ride feel. The shock features five-way preload adjustability, which allows riders to adjust the stiffness and ride height to suit body weight or when riding two-up. The shock is easily adjustable with the on-board tool kit. The overall suspension of the Z400 offers the plushness found on the larger models in the Z family for everyday riding comfort. 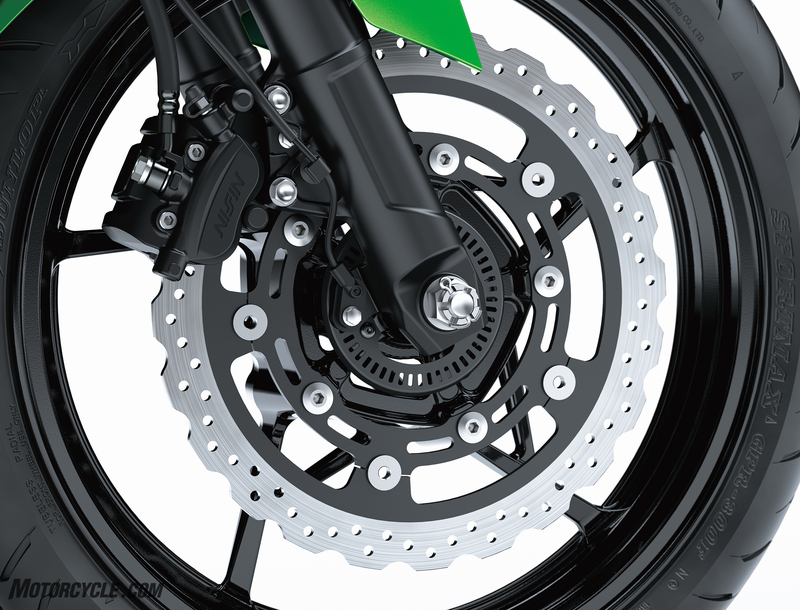 To enhance handling and performance, the Z400 motorcycle comes equipped with a largest in class 310 mm semi-floating petal front disc, which is gripped by a balanced actuation dual-piston caliper. The front brake master cylinder design helps eliminate ineffective stroke for increased control. Handling the rear braking duties is a 220 mm petal disc, which is slowed by a dual-piston caliper with large 27 mm pistons. The front and rear brake hose material and dimensions were carefully selected to offer excellent brake feedback. 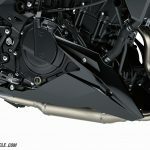 The Z400 ABS features Nissin’s latest ABS control unit. 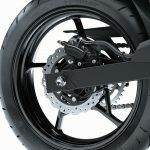 The wheels and tires also follow the same weight savings theme applied throughout the build of the Z400. The stylish and lightweight five-spoke star-pattern wheels offer lateral rigidity and contribute to the bike’s stability and lightweight image. The wheel design is a product of technology gained in World Superbike competition. The lightweight radial tires on the Z400 contribute to both agile handling and riding comfort. The 150 mm rear tire imposes an aggressive looking rear end for the newest member of the Z family. 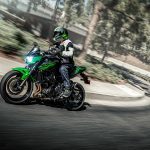 Kawasaki’s Z styling is known for providing an aggressive and premium look that comes to life with an ideal blend of sporty performance and everyday versatility. 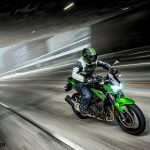 The new Z400 boasts the sharp, aggressive styling similar to that found on the Kawasaki Z650 and Z900 and leaves a lasting impression for bystanders. 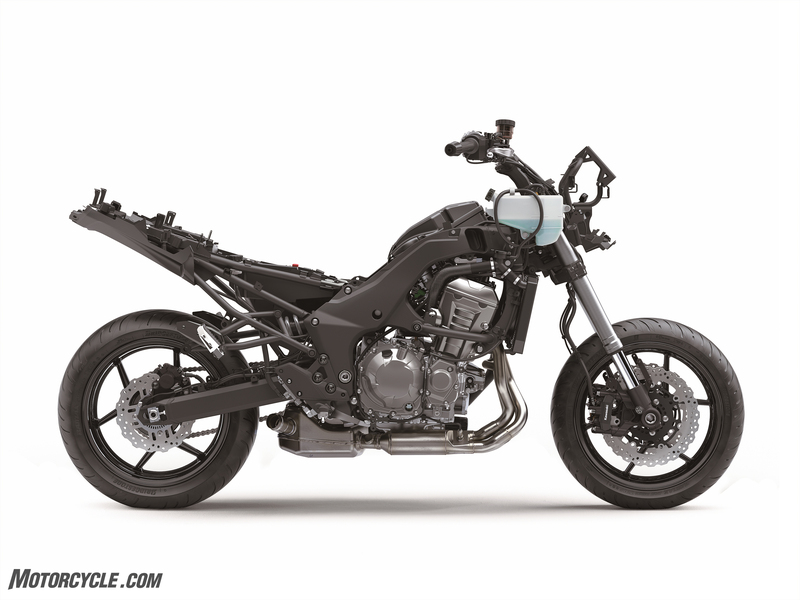 A staple in the Z family, the Sugomi design elements provide a crouching stance, low-positioned head, and upswept tail to give the Z400 motorcycle a silhouette that is instantly recognizable as a Kawasaki supernaked. This design of the bodywork on the Z400 enhances the appearance of the engine and exhaust and highlights the functional beauty of the engine, elegantly curved exhaust header pipes, and trellis frame. Sharp design of the front cowl is complemented by a compact, dark meter visor that adds to the aggressive and sporty looks. In addition to the sharp looks is an LED headlamp that offers increased brightness in its wide illuminated path. The aggressive front fender design features holes cut into the sides. The bodywork packs the punch of a much larger machine, which is reinforced by its superb fit and finish. Sharp rear turn signals complement the aggressive Z styling; both front and rear turn signals utilize clear lenses for a high-quality look. A sculpted upswept tail cowl and LED taillight design also contribute to a sharp impression from the rear of the bike. Elegant mirror stays mount the mirrors to the wide, flat handlebars. The bike also features a forward-slant of the compact fuel tank to contribute to its distinct design. The relaxed rider triangle of the Z400 motorcycle accommodates a wide array of riders and riding situations. 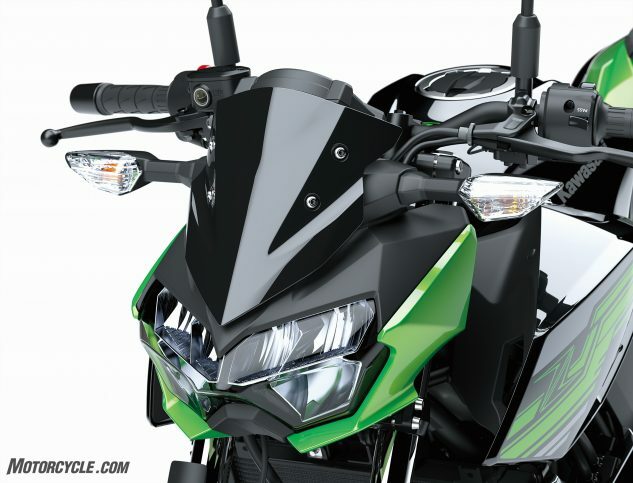 The Z400 features a relatively upright riding position, wide handlebar, and a more sporty yet forward footpeg position that allow the rider to control the bike while also offering rider comfort. The slightly forward positioning of the sporty aluminum footpegs contributes to direct feel, good controllability, and a comfortable riding position. 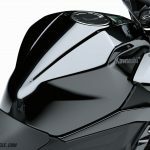 The design of the bodywork on the Z400 offers ride comfort. The sleek fuel tank design enables good contact with the bike for increased control, all while helping keep weight to a minimum. The seat height and narrow design make it even easier for riders to get their feet to the ground. A deep seat pan allows for a 90 mm low-rebound urethane seat cushion, offering excellent ride comfort. Kawasaki engineers placed great emphasis on making sure the cockpit of the Z400 was clean and easy to read. 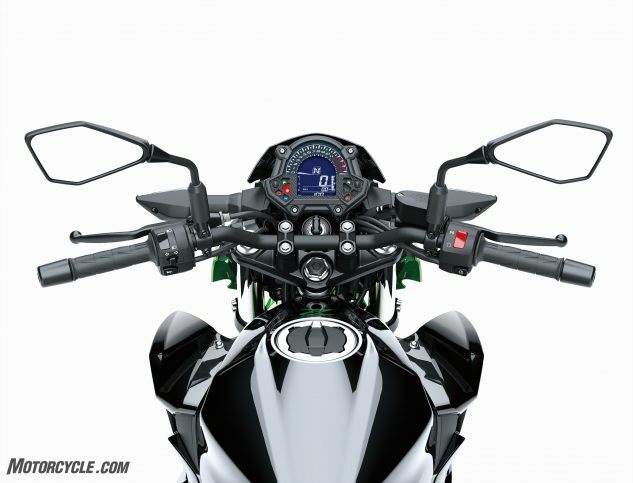 The stacked instrument cluster is similar in size to that found on the Z650 model, and features a new large analog tachometer face, and gear position indicator at its center. The instrument cluster sits above a multi-function negative display LCD screen. 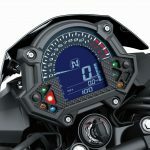 The gear position indicator enhances confidence while also contributing to the Z400’s sporty image. In addition to the digital speedometer and gear position indicator, display functions include: odometer, dual trip meters, fuel gauge, remaining range, current and average fuel consumption, coolant temperature, clock and the Economical Riding Indicator. The Economical Riding Indicator appears on the LCD screen to indicate favorable fuel consumption, notifying riders when they are operating within the optimal conditions to maximize their fuel efficiency. 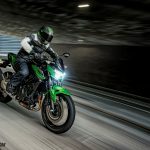 Kawasaki offers a full line of accessories for the 2019 Z400 motorcycle, enabling customers to personalize their bikes in a number of different ways. 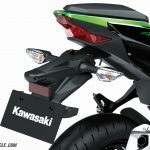 Available Kawasaki Genuine Accessories include a frame slider set, lower cowling, tank pad, knee pad set, radiator screen, and front axle slider set to maintain the fit and finish of the bike. 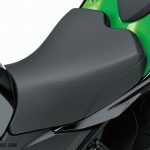 To enhance comfort, Kawasaki also offers an Ergo-Fit Extended Reach seat. 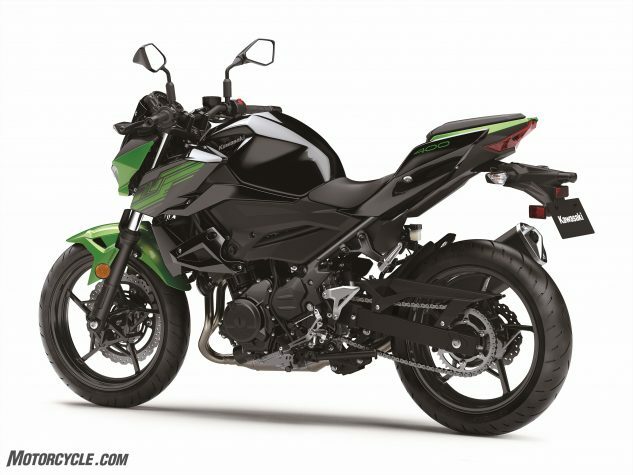 The Z400 ABS is available in two colors: Candy Lime Green / Metallic Spark Black and Candy Cardinal Red / Metallic Flat Spark Black.